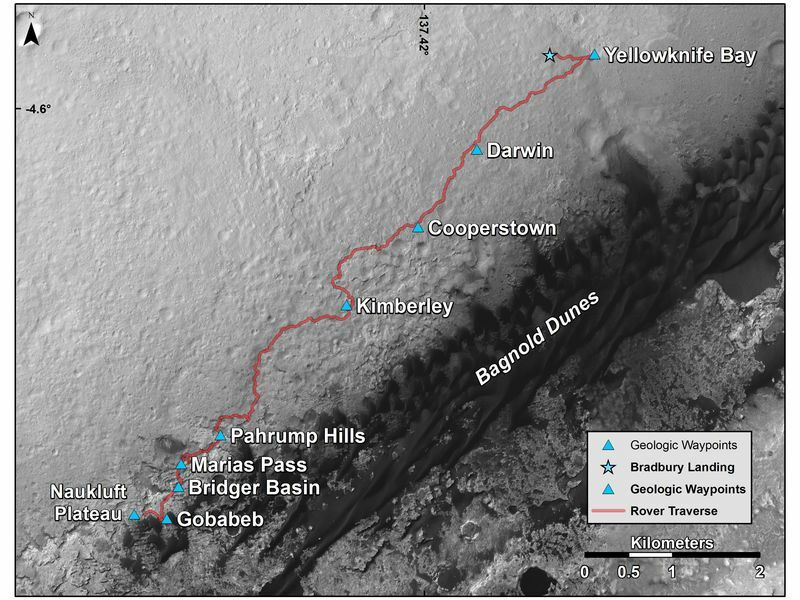 This map shows the route driven by NASA's Curiosity Mars rover from the location where it landed in August 2012 to its location in early March 2016, approaching a geological waypoint called "Naukluft Plateau." 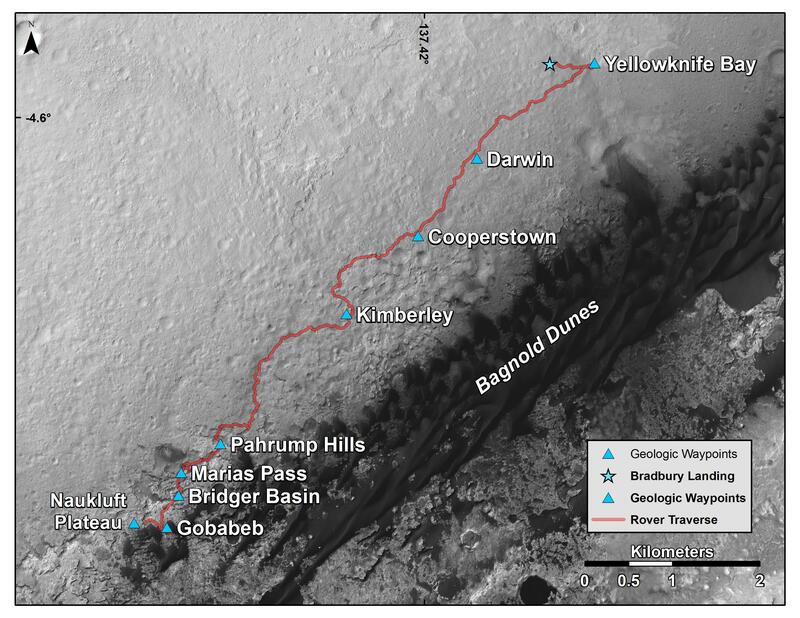 Curiosity departed the "Gobabeb" waypoint, where it scooped samples from a sand dune for analysis, on Feb. 3, 2016, with a drive during the 1,243rd Martian day, or sol, of the rover's work on Mars. 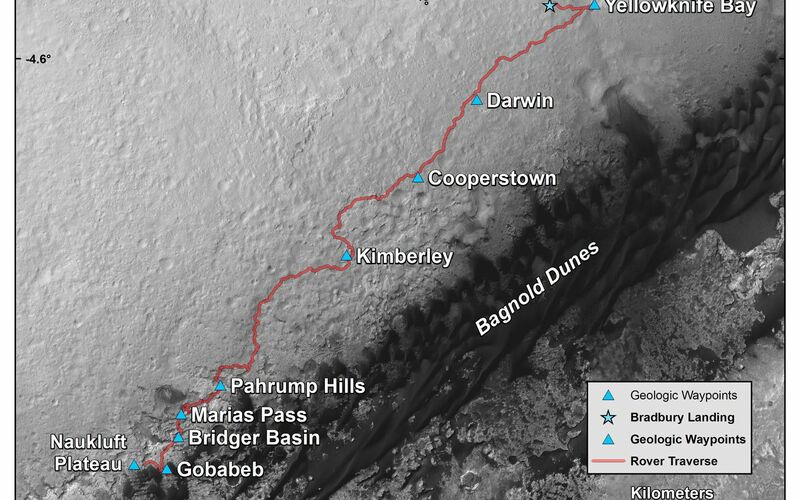 The base image for the map is from the High Resolution Imaging Science Experiment (HiRISE) camera on NASA's Mars Reconnaissance Orbiter. North is up. Bagnold Dunes form a band of dark, wind-blown material at the foot of Mount Sharp. 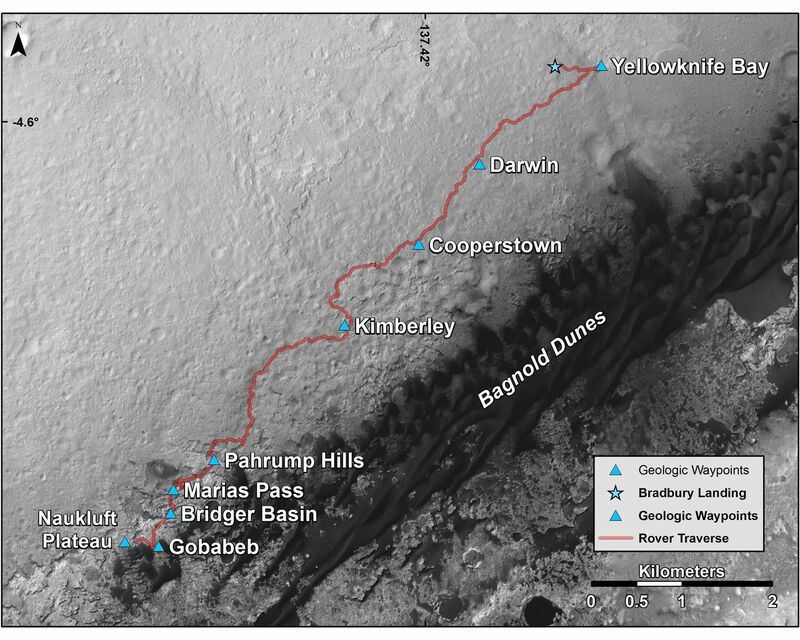 As the rover continues uphill on Mount Sharp, one category of researchers on its science team has been refreshed by the mission's second round of participating-scientist selections. NASA chose 28 participating scientists from 89 scientists who submitted proposals. They play active roles in the day-to-day science operations of the rover as members of a science team that also includes about 120 investigators and 320 collaborators. The scale bar at lower right represents two kilometers (1.2 miles). For broader-context images of the area, see PIA17355, PIA16064 and PIA16058. NASA's Jet Propulsion Laboratory, a division of the California Institute of Technology, Pasadena, manages the Mars Science Laboratory Project and Mars Reconnaissance Orbiter Project for NASA's Science Mission Directorate, Washington. For more information about the Mars Science Laboratory mission and the mission's Curiosity rover, visit http://www.nasa.gov/msl and http://mars.jpl.nasa.gov/msl.